I recently discovered a serious flaw with Dell System Detect that allowed an attacker to trigger the program to download and execute an arbitrary file without any user interaction. Below is a summary of the issue and the steps taken to bypass the protections Dell put in place. The issue was fixed within two months and Dell were clear in their communications throughout. Anyone who has owned a Dell will be familiar with the Dell Support page. You can get all the latest drivers for your exact machine configuration from this site by entering your Dell Service Tag, which can be found on a sticker somewhere on your machine or through clicking the shiny blue “Detect Product” button. Clicking this button prompts you to download and install the “Dell System Detect” program, which is used to auto fill the service tag input and show you the relevant drivers for your machine. While investigating this rather innocuous looking program I discovered that it accepts commands by listening for HTTP requests on localhost:8884 and that the security restrictions Dell put in place are easily bypassed, meaning an attacker could trigger the program to download and install any arbitrary executable from a remote location with no user interaction at all. So that’s our first issue: the program attempts to verify that the request is sent from a Dell domain by only checking if “dell” is in either the HTTP Referrer or Origin headers. Why is this a problem? The HTTP Referrer can contain the full request URI including the host and path. This means an attacker could easily make a request with an origin of “https://hacker.com/dell" and this would pass the initial test as “dell” is in the string. This function splits the request URL by the slash and uses the first two components to find the correct service to execute. In the Chrome screenshot above we see that the web page is making a request to clientservice/isalive, which means the program will execute the isalive method in the clientservice service. 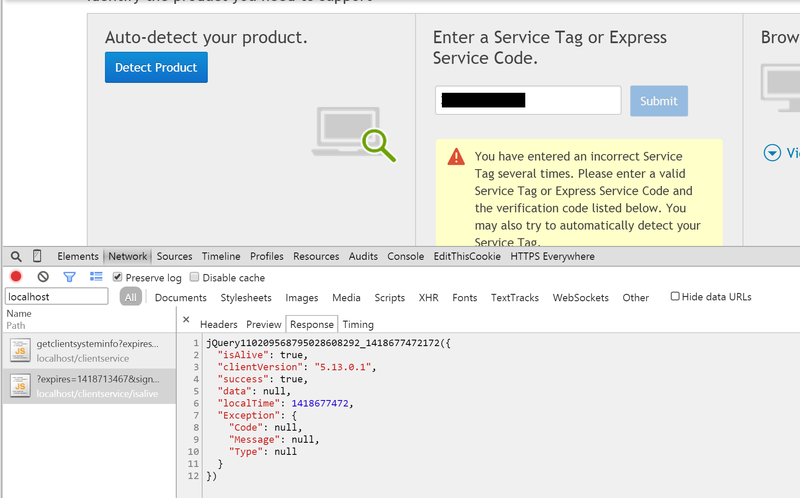 After the service has been found it inspects two query string parameters, signature and expires, and passes them to the Authenticate method. If this passes then the service is invoked with other query string parameters as arguments. It seems obvious by now that the program does a little bit more than simply retrieve your service tag, so before we look into the Authenticate method let’s see what interesting things we can do. There are three services that can be used: diagnosticservice, downloadservice and clientservice. Within these are 25 methods, including getservicetag, getdevices, getsysteminfo, checkadminrights and downloadfiles. It seems that the entire Dell system support package is included with System Detect, meaning if we can bypass the authentication then we can trigger any of these methods. The most interesting method is called downloadandautoinstall, which does exactly what it says on the tin. Wow. Ok, so not exactly the hardest thing to break. The service, method, expiration and signature arguments are all attacker controlled and passed through GET arguments. The only thing not controlled by a remote attacker is the hard-coded GUID “2f68-48be-a09a-9f9b6424ad85”. So in conclusion we can make anyone running this software download and install an arbitrary file by triggering their web browser to make a request to a crafted localhost URL. This can be achieved a number of ways, and the service will faithfully download and execute our payload without prompting the user. I don’t think Dell should be including all this functionality in such a simple tool and should have ensured adequate protection against malicious inputs. After contacting Dell and discussing the issue with their internal security team they pushed out a fix that included obfuscating the downloaded binary. While I cannot be sure I think they simply changed the conditional from “if dell in referrer” to “if dell in referrer domain name”, which may be slightly harder to exploit but just as severe. There is now also a big agreement you have to accept before downloading that specifies what the software can do.